Recently built by the owners, Las Piedras is a fabulous detached villa offering complete privacy and which also enjoys stunning panoramic views across the mountains and sea. Attention to detail and design is incredible and is reflected throughout this unique villa. 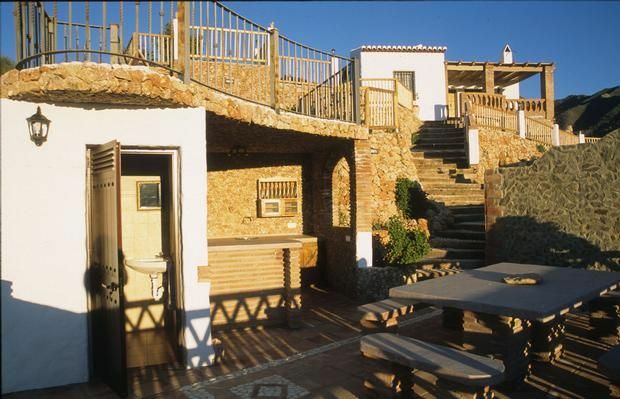 Located on the edge of the National Park, Las Piedras nestles on the slopes surrounded by olive and avocado groves. Not only does Las Piedras offer boutique accommodation, but together the wonderful outside terraces and swimming pool, complete with waterfall, it would be a highlight for any visitors who are looking for somewhere very special for their holiday. Frigiliana village itself which is just 5 minutes drive away, is a beautiful white washed village rich in history and once you stroll through the picturesque maze of cobbled streets, you will find plenty of restaurants and bars to choose from for an evening out. Frigiliana countryside and village is ideal for those wanting a unique experience but still desire the 'buzz' of Nerja only 15 minutes away. En-suite to bedroom with large feature tiled bath with overhead shower, w.c. and w.h.b. Lower terrace with table and seating for many! Cloakroom adjacent to the barbeque terrace with w.c. and w.h.b.